Persius, in full Aulus Persius Flaccus, Roman poet and satirist. According to the Life contained in the manuscripts, Persius was a native of Volaterrae, of good stock on both parents' side. When six years old he lost his father, and his step-father died in a few years. At the age of twelve Persius came to Rome, where he was taught by Remmius Palaemon and the rhetor Verginius Flavus. Four years later began a close intimacy with the Stoic Cornutus. In this philosopher's pupil Lucan, Persius found a generous admirer of all he wrote. Still in early youth he became the friend of the lyric poet Caesius Bassus, while with Thrasea Paetus (whose wife Arria was a relative) he had a close friendship of ten years' duration and shared some travels. Seneca he met later, and was not attracted by his genius. In his boyhood Persius wrote a tragedy dealing with an episode of Roman history, and a work, the title of which is rendered uncertain by corruption in our manuscripts. Pithou's generally accepted reading makes the subject that of travel; the excursions with Thrasea however must have taken place after boyhood. the perusal of Gaius Lucilius revealed to Persius his vocation, and be set to work upon a book of satires. But he wrote seldom and slowly; a premature death (uitio stomachi) prevented the completion of his task. He is described as possessed of a gentle disposition, girlish modesty and personal beauty, and living a life of exemplary devotion towards his mother Fulvia Sisenna, his sister and his aunt. To his mother and sister he left a considerable fortune. Cornutus suppressed all his work except the book of satires in which he made some slight alterations and then handed it over to Bassus for editing. It proved an immediate success. The scholia add a few details -- on what authority is, as generally with such sources, very doubtful. The Life itself, though not free from the suspicion of interpolation and undoubtedly corrupt and disordered in places, is probably trustworthy. The manuscripts say it came from the commentary of Valerius Probus, no doubt a learned edition of Persius like those of Virgil and Horace by this same famous "grammarian" of Berytus, the poet's contemporary. The only case in which it seems to conflict with the Satires themselves is in its statement as to the death of Persius's father. The declaiming of a suasoria in his presence implies a more mature age than that of six in the performer. But pater might here mean step-father, or Persius may have forgotten his own autobiography, may be simply reproducing one of his models. The mere fact that the Life and the Satires agree so closely does not of course prove the authenticity of the former. One of the points of harmony is, however, too subtle for us to believe that a forger evolved it from the works of Persius. It requires indeed a thoughtful reading of the Life before we realize how distinct is the impression it gives of a "bookish" youth, who has never strayed far, at least in spirit, from the domestic hearth and his women-folk. And of course this is notoriously the picture drawn by the Satires. So much better does Persius know his books than the world that he draws the names of his characters from Horace. A keen observer of what occurs within his narrow horizon, he cannot but discern the seamy side of life; he shows, however, none of Juvenal's undue stress on unsavory detail or Horace's easy-going acceptance of human weaknesses. The sensitive, home-bred nature of Persius shows itself perhaps also in his frequent references to ridicule, whether of great men by street gamins or of the cultured by Philistines. The chief interest of Persius's work lies in its relation to Roman satire, in its interpretation of Roman Stoicism, and in its use of the Roman tongue. The influence of Horace on Persius can, in spite of the silence of the Life, hardly have been less than that of Lucilius. Not only characters, as noted above, but whole phrases, thoughts and situations come direct from him. The resemblance only emphasizes the difference between the caricaturist of Stoicism and its preacher. Persius strikes the highest note that Roman satire reached; in earnestness and moral purpose rising far superior to the political rancor or good natured persiflage of his predecessors and the rhetorical indignation of Juvenal, he seems a forerunner of the great Christian Apologists. From him we learn a lesson Seneca never taught, how that wonderful philosophy could work on minds that still preserved the depth and purity of the old Roman gravitas. When the Life speaks of Seneca's genius as not attracting Persius, it presumably refers to Seneca the philosopher. Some of the parallel passages in the works of the two are very close, and hardly admit of explanation by assuming the use of a common source. With Seneca, Persius censures the style of the day, and imitates it. Indeed in some of its worst failings, straining of expression, excess of detail, exaggeration, he outbids Seneca, while the obscurity, which makes his little book of not seven hundred lines so difficult to read and is in no way due to great depth of thought, compares very ill with the terse clearness of the Epistolae morales. A curious contrast to this tendency is presented by his free use of popular words. As of Plato, so of Persius we hear that he emulated Sophron; the authority is a late one (Lydus, De mag. I 41), but we can at least recognize in the scene that opens the third Satire a kinship with such work as Theocritus' Adoniazusae and the Mimes of Herodas. 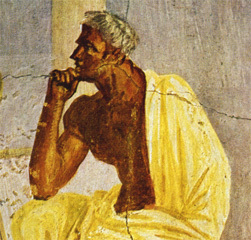 Persius's satires are composed in hexameters, except for the scazons of the short prologue above referred to, in which he half ironically asserts that he writes to earn his bread, not because he is inspired. The first satire censures the literary tastes of the day as a reflection of the decadence of the national morals. The theme of Senecas 114th letter is similar. The description of the recitator and the literary twaddlers after dinner is vividly natural, but an interesting passage which cites specimens of smooth versification and the languishing style is greatly spoiled by the difficulty of appreciating the points involved and indeed of distributing the dialogue (a not uncommon crux in Persius). The remaining satires handle in order (2) the question as to what we may justly ask of the gods (cf. Plato's second Alcibiades), (3) the importance of having a definite aim in life, (4) the necessity of self-knowledge for public men (cf. Plato's first Alcibiades), (5) the Stoic doctrine of liberty (introduced by generous allusions to Cornutus' teaching), and (6) the proper use of money. The Life tells us that the Satires were not left complete; some lines were taken (presumably by Cornutus or Bassus) from the end of the work so that it might be quasi finitus. This perhaps means that a sentence in which Persius had left a line imperfect, or a paragraph which he had not completed, had to be omitted. The same authority says that Cornutus definitely blacked out an offensive allusion to the emperor's literary taste. The parallels to passages of Horace and Seneca are recorded in the commentaries.